After a freshman season playing a backup role behind a loaded North Carolina frontline, James McAdoo had immense expectations placed on his shoulders when he returned for his subsequent seasons. McAdoo was named to the All-ACC Second team in both his sophomore and junior seasons, but never seemed to be able to make the leap to the next level and dominate a collegiate game on a regular basis. He now heads to the NBA draft a year early, as a projected second round pick trying to find the right system to help him develop into a valuable rotation player. McAdoo's biggest assets as he moves toward the draft process are still his physical tools. At 6'9, he may have average size for the power forward position but his excellent frame, 7'1 wingspan, and strong athleticism help him compensate for this issue. He is a high energy player, often flying around the court to make hustle plays like fighting for loose balls, taking charges and keeping rebounds alive. Offensively, McAdoo does multiple things adequately but nothing exceptionally well, which is part of the reason he struggled in the go-to role he inherited as a sophomore and junior as part of young UNC squads that failed to get out of the first weekend of the NCAA Tournament. Despite playing a relatively heavy usage role in each of the past two seasons, he struggled badly with his efficiency, posting a true shooting percentage of 46 and 49% in his sophomore and junior seasons respectively, which ranked dead last among all current Top-100 prospects both years. One of his best skills is his quickness, allowing him to beat opposing big men down the floor in transition. His quick first step also helps him explode past defenders when he catches on the perimeter, usually needing one dribble after his first step to get to the rim. McAdoo is a solid finisher around the rim when someone else creates a shot for him, converting 59.3% of his non-post-up around the basket half-court attempts, according to Synergy Sports, while showing an ability to finish through contact, as he had 22 And-1 chances last season. What hurts McAdoo's pro prospects has been his inability to become any sort of threat as a mid-range jump shooter, and his struggles seemingly understanding that. According to Synergy Sports Technology, McAdoo converted just 22% of the 51 jump shots he took last season, easily one of the worst marks in this draft. The year before, he attempted 96 jumpers, and hit just 28%. His form is salvageable, with his follow-through being the area that needs the most improvement. His first step should allow him to beat slower defenders off the dribble, but without a usable jump shot, defenses will just sag off him, leaving him no room to drive. Along the same lines, McAdoo could grow into a dangerous pick and roll player if he consistently hit a mid-range jump shot. With his agility, he can roll to the rim with ease but defenses will adapt to take this away if he isn't a threat to shoot jump shots. McAdoo will be a one-dimensional player and easy to guard if he cannot add this to his repertoire quickly. McAdoo also showed some flashes of promise in the post but not enough to prove to NBA teams that he will be able to regularly score at the next level. He didn't show much in the way of advanced footwork or a power game, but was able to maneuver around players with his quickness and length. He was a willing post passer, recognizing when a double team was coming and finding the open teammate for an easy shot. To be an effective post scorer in the NBA, something he was unable to emerge as in college (39% FG% as a junior, 35% as a sophomore) he will need to improve his footwork to score against defenders of similar physical tools and athleticism. Defensively, McAdoo can be a versatile defender, as his combination of size and length can help him defend post players, while his foot speed allows him to defend guards for short stretches in switches. He could develop into a great defender out of the pick and roll, as he will be able to execute multiple coverages. He still has some room to add some bulk to his frame, which will help him against stronger power forwards. McAdoo has been a below average rebounder his entire collegiate career, which ended with him grabbing only 5.2 defensive rebounds per 40 minutes pace adjusted, second worst among power fowards in our top 100 rankings . He's also an average offensive rebounder, pulling down 3.3 per 40 minutes pace adjusted. His energy and length should seemingly help him become a more productive rebounder in the right system, but this never translated to the college level for one reason or another. Once projected as a lottery pick, McAdoo's basketball skills and overall productivity have yet to catch up to his potential and physical tools. He won't have the physical advantage he did in college, so he will need to find new ways to impact the game. 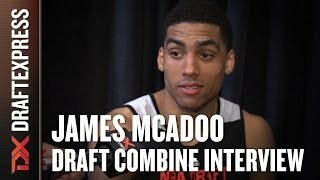 McAdoo should hear his name called on draft day due to his athleticism and reputation by a team hoping they can mold him into a NBA player, but he needs to improve in some key areas to stick. Stuck in the shadows of NBA first-round picks Harrison Barnes, John Henson, and Tyler Zeller in North Carolina's front court rotation, James McAdoo averaged just 15.6 minutes per-game last season. Other than the three games he started in mid-March after John Henson suffered a wrist injury, the former McDonald's All-American was not asked to do much more than play hard, crash the glass, post up occasionally, and make the most of his opportunities in the paint as a freshman. With both Zeller and Henson now playing in the NBA, North Carolina will look to McAdoo, the team's only returning post player to have averaged over 5 minutes per-game last season, to emerge as a star. Parts of last season were certainly a struggle for the Virginia Beach native, but if McAdoo's progress late in the year is any indication, he is going to have a breakout season and substantiate much of the draft buzz surrounding his decision to stay in school last spring. Measured at 6'9 in shoes with a 7'1 wingspan a little over a year ago at the Amar'e Stoudemire Skills Academy, McAdoo has a near-prototypical frame for an NBA power forward, despite being slightly undersized. He has steadily added weight to his frame since emerging as an elite recruit, and certainly looks the part of a top prospect at his position, even if he has room to improve his frame down the road. Athletically, McAdoo's is an incredibly smooth, fluid player, running the floor extremely well for a big man, showing very good quickness defensively, and proving to be significantly more explosive at the basket than he appears at first glance. It was McAdoo's ability to make the most of his athleticism and find a comfort level with his role and the speed of the college game that limited him early last season. Looking lost on both ends of the floor for stretches, especially against ACC competition, McAdoo shot just 36.5% from the field in conference play. Amid infrequent moments of brilliance, McAdoo struggled to convert his one-on-one opportunities on the block, appeared rushed a bit too often, made some questionable passes in traffic, and simply didn't look comfortable shooting from the midrange. McAdoo's difficulties weren't entirely surprising there's certainly something to be said for adjusting to being a role-player off the bench at the highest level of college hoops- but his inefficiency and decision-making were something of a shock. One of the most fundamentally sound big men to come out of the high school ranks in recent years, we've marveled on more than one occasion at his extraordinary feel for the game, relaxed demeanor, and ability to make plays facing the basket. It wasn't until March that McAdoo seemed to really get a handle on where he fit in on the star-studded UNC roster and how he could make a consistent impact. The biggest changes for McAdoo came on the offensive end, where he scored an excellent 1.039 points per-possession in the month of March, a big jump from the 0.796 he had scored to that point. Appearing more active within the Tar Heels' half-court offense, McAdoo did a much better job being patient when he got the ball on the block, aggressively attacking the offensive glass, and finding open space playing off of Tyler Zeller. Finishing a number of highlight reel tip-dunks and dropping in a few turnaround jumpers in the post late in the year, McAdoo stepped up when his team needed him most with John Henson and Kendall Marshall out of action, and offered intriguing glimpses of what's to come. In returning to school, McAdoo has put himself in position to build on his play late in the year and solidify his place among the top prospects in this draft. He'll need to continue doing all the positive things he did late in the year, and show improvement as a face-up threat, one-on-one scorer, and jump shooter to accomplish that. Making 8 of the 32 jump shots he attempted last season (25%) and 20 of the 64 shots he attempted in the post (31.3%) as a freshman, the onus will be on McAdoo to show that he can be the dynamic threat on the block and consistent set shooter facing the rim he had the making of coming out of Norfolk Christian High School. Playing alongside experienced guards like Dexter Strickland and Leslie McDonald should help McAdoo's cause, but he will be asked to create his own shot and score from a variety of spots on the floor to help Roy Williams make up for the immense amount of talent he lost last spring. Defensively, McAdoo had some excellent moments during his freshman year. Showing uncanny anticipation, the 19-year old forward was at his best playing the passing lanes when his man stepped out onto the perimeter, finishing the year averaging 2 steals per-40 minutes pace-adjusted, many of which he took coast-to-coast for a dunk on the other end. Always competing, McAdoo did a good job cleaning the glass and defending face-up four men, showing good lateral quickness away from the rim, but working himself out of position at times, both in the midrange and in the post. It will be interesting to see how McAdoo fares defending the post this season, as he could see some minutes defending the center position in smaller lineups depending on how North Carolina integrates incoming freshmen Joel James and Brice Johnson. McAdoo defended back-to-the-basket scorers with mixed results last season, struggling against stronger forwards, but getting better as the year went on. While it can be difficult to project the trajectory of underclassmen who are about to undergo major role changes at high-profile programs like North Carolina, McAdoo's situation seems like a safe bet considering he could have been a lottery pick had he declared for the 2012 draft, even if his freshman year was rather non-descript on paper. His play late in the season, advanced feel for the game, and absolutely unwavering demeanor on the floor will give him every opportunity to make the most of what is expected to be a breakout year. McAdoo was the other MVP of this squad, along with Bradley Beal. Opposing international teams were ill-prepared to deal with such a skilled and fundamentally sound big man, as he's simply light years ahead of other players his age at this stage. McAdoo is not exceptionally tall, but he has a superb wingspan and a nice frame that will surely fill out in time. He is more smooth than he is explosive, but he's still a very good athlete any way you slice it. Showing excellent timing, terrific hands and a great feel for moving to open spots and presenting himself for his guards at the rim, McAdoo made a killing at this tournament simply by being at the right place at the right time and finishing his opportunities around the basket. He can do so in finesse style with either hand or by aggressively dunking the ball from well above the rim. He rarely misses an opportunity to put points on the board for his team, be it in the paint or from the perimeter with his solid shooting ability and ball-handling skills. He's the type of player who everything comes easy for and whose feel for the game, physical attributes and skill level will allow him to make an immediate impact at North Carolina. He grabbed a decent amount of rebounds on both ends of the floor at this tournament, as well. With that said, he struggled a bit on the defensive end and seems to lack a degree of strength and toughness.